(Newser) – Friday was a "glorious day" in Barron, Wis., as officials offered details on Jayme Closs' escape from her captor. The good news continued after the Friday presser with a long-awaited reunion between Jayme and her family, and there's a new photo of the smiling 13-year-old that's making the rounds. 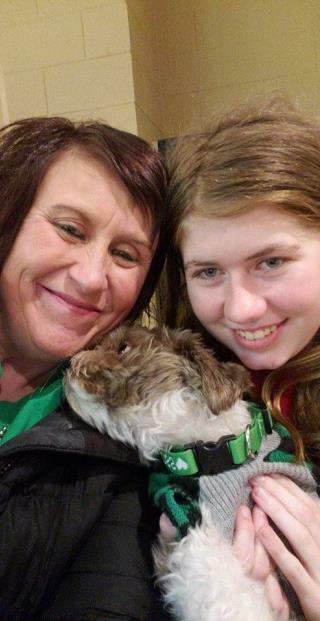 The picture in People, the first one of Jayme since she was found, shows her beaming next to her aunt Jennifer Smith, both huddled over Jayme's dog, Molly. "She is so glad to be home," says family friend Jennifer Havorson, who's said to be tight with Jayme's aunts. "And she is obviously thrilled to have her dog." Havorson adds that Jayme had begged her mom, Denise—who was murdered, along with Jayme's father, James, the day Jayme was abducted—for the dog and that "finally, Denise caved. That dog was super important to her." Havorson also notes that Jayme was very close with Smith, who is Denise Closs' sister and will now serve as Jayme's legal guardian. Is it weird that my first response was happy for the dog? Who's idea was it to do a photo op of this deeply traumatized child? She needs privacy and lots of breathing room right now. Thank God she has wonderful aunts to support her through this nightmare. All the best Jayme. Hopefully that rat will find the DeCon.